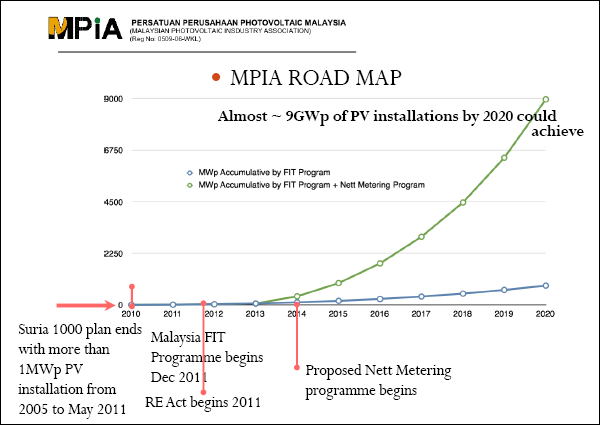 We have learnt and heard on many roadshows and publications what SEDA thinks are the best ways to fuel the growth of the solar PV energy sector in Malaysia. It's mainly by incentivising the industry by implementing the feed-in tariff. The feed-in tariff (FiT) mechanism works such that individuals and organisations are paid premium price per unit of energy produced from renewable sources. MPIA Road Map: Snapshot of the presentation slide of MPIA president, Mr. Ahmad Shadzli Abdul Wahab during the "Konvensyen Tenaga Lestari 2013" in Kota Kinabalu back in November last year. In this approach, the solar energy generator uses the power first and feeds the unused power to the grid. This differs from the present FiT scheme where all generated power goes to the grid. Government is gradually withdrawing gas subsidy until 2015 and electricity prices are foreseen to hike further. Commercial and industrial premises will want to install PV systems to produce energy for their own use. The sector now consumes 70% of our electricity supply - 40,000GWh by commercial premises and 30,000GWh by industrial premises in 2010. MPIA also suggests the installation of large-scale solar utilities of over 30MW as only such sizeable facilities can divert the current dependence on fossil fuel power plants. Currently, the largest solar farm in the country is of 10MW capacity. Thailand, on the other hand, already has a 84MW solar farm, located in Lop Buri Province. The 10 billion Baht (US$335 million) solar farm was completed in May 2013. The association urges for fiscal incentives to make PV systems cheaper, such as expanding the current exemption on import duty and sales tax for solar modules and inverters to all PV system equipment and components. With these incentives, the industrial and commercial sector will be able to get a return on their investment in under 10 years, noted the association. The tax exemptions will also make installation of PV systems more attractive for holiday chalets and small-scale food processing industries in remote areas, many of which now rely on diesel generators. No doubt this will encourage more people and businesses to invest in PV systems. MPIA also contended that current tax incentives assist companies but not house-owners. For instance, the waiver on sales tax for solar cells and inverters benefits only operators of big solar installations. It will be tedious for home-owners to fill numerous forms to obtain the waiver. There is also financial support for companies under the Green Technology Financing Scheme whereby the Government subsidises 2% of the interest on loans taken to finance green projects. Keen to see more houses with PV systems, the association disagrees with Sustainable Energy Development Authority’s (SEDA, the statutory body that administers the FiT scheme) current approach of emphasising commercial projects. TheGreenMechanics: Recently during a Q&A session with one of the implementers of solar PV systems in Kota Kinabalu, I asked the gentleman if Kumpulan Melaka Berhad (KMB) got their 5MW quota from bidding or was it negotiated with SEDA? KMB is also already eyeing a second solar farm costing RM20 million, which I reckon would not be less than 2MW in capacity. The gentleman answered it was through bidding but I could sense the lack of affirmitiveness in his body language. Maybe it is, but my point is that, we only have so much of quota every year and the big chunk of the cake goes to the commercial/industry players.